After the introduction to the different geeky sub-cultures, the book travels through many of the different wards of the city. In each location, you are treated to what could be a walking tour of the area, where someone looking for that geeky connection can find like minded individuals or just places with a connection to it. Boutiques and hobby shops are popular places to be featured as well as funky toy places and theatres. You're also provided with a list of fairs and festivals so you can time your trip accordingly, some museums you might which to visit, and plenty of travel tips. Also, lots of colorful pictures. For me, I'm probably older than the target audience for the book, where that would more typically be the millennials. With that said, I thoroughly enjoyed the book and wish I visited a friend who was stationed over there to do some of the things mentioned in the book. 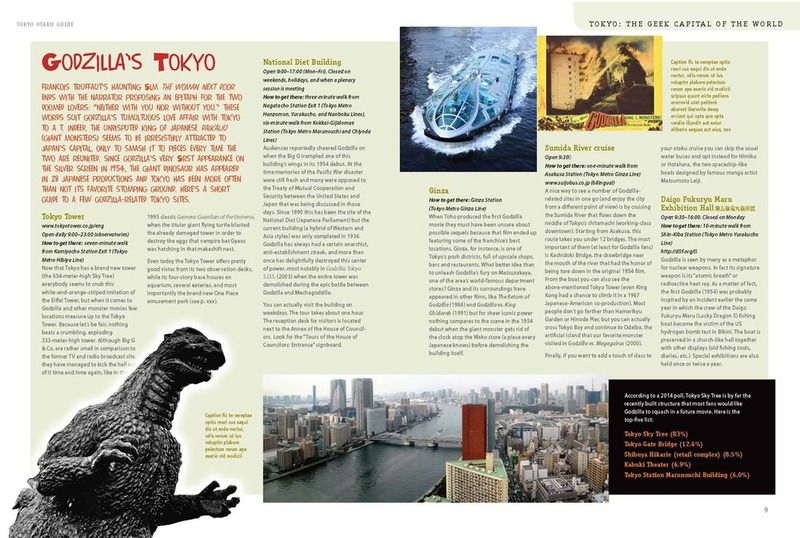 I never thought about doing a Godzilla tour of Tokyo, for instance. 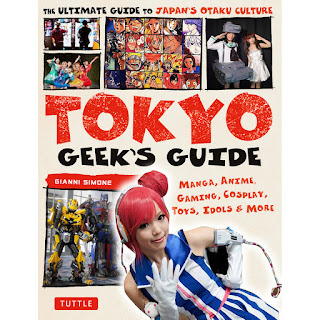 If you know a geeky person who has an interest in Japanese culture who is considering a visit to Tokyo, this would make a great gift for them. I shared the book with a friend who visited Tokyo frequently due to his working for the US branch of a Japanese company. He enjoyed the book thoroughly and it brought back memories of his travels. He's not that geeky though, but mentioned he wished he had known about several of the places described. A second title to consider is A Geek in Japan: Discovering the Land of Manga, Anime, Zen, and the Tea Ceremony. It is a little older, having come out in 2011, but goes beyond just Tokyo. Both serve as youthful prep reading for a visit or for just a fan of Japanese culture. I love this! I need a geek's guide to Tokyo!